The industry is swinging to cloud as the main revenue source since the PSTN is closing and thus access to copper. The idea of the Office is migrating to mobile, which is the number one reason for cloud services - access anywhere. More and more businesses have to do more with less people. Productivity is a benefit of cloud services, especially integrated apps. That said as I hear all the analysts and pundits (and even carrier execs) scream about Cloud, I have to say to the whole Channel. Don't listen to them. That's right: don't listen to them. (Or me). You have a business that is obviously working. Listen to your Customers. Your Customers are your primary asset. Talk to them. If they are asking for VPS, MDM, Hosted Exchange, Dropbox or backup, when you ask them about it - then you are good to go. Gartner, Frost, even Channel execs - what the heck do they know about being an Agent or VAR? I hear this often though: We talk to a bunch of Agents every day. If I talk to 4 doctors a day, can I perform your next surgery? Come on. I'll give you a spiff! You could win a trip if I don't perform malpractice instead. No one knows your business like you do. The only advice you need to hear: Talk to your Customers. Ignore the rest of the noise. I'm in this space and I am so sick of all the cloud predictions I want to throw up. Of course, it is going to grow. 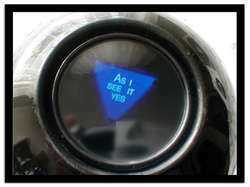 I can use a Magic 8 ball and get that prediction. Cloud is still small. (It is only 1/12 of Amazon income.) It is going to grow -- or a whole bunch of companies are going to BK. Last point: I was on a VAR-telecom webinar this week where the slide was Agent Wins! VAR Loses in a big sale. In sales, it is mostly about relationship. When all is said and done, people will do business with people they like and trust. Branding is about building trust and recognition. So ignore the carriers and the analysts. Talk to your customers. And then if you want advice, ask a fellow Agent. Happy Holidays!